Which brought me to another idea. Using StackExchange API we could target Social Media outlets by pulling certain posts containing keywords (Like Ubuntu) and running that post through a search to see if a relevant question appears. If a high enough Percentage match exists then reply to that user with the URL. I'm not one to go off making bots to destroy users life and fear this may have some backlash - but I think it might be a possibly helpful endeavor for both unknowingly new users and this site's success. I've continued my caffeine fueled adventure and decided to start some base line tests to see how effective this might be. The AskUbuntu twitter account has been registered by someone other than me (If you're a community member let us know - that account may come in handy) in the meantime I've registered UbuntuExchange and continued my efforts outside of my personal Twitter account. I've begun digging into the Twitter API and StackExchange API to become more familiarized with the kind of effort needed for a project like this. I've also asked some of the other MODs on StackExchange sites (The Cooking site seems to have taken a hold of the opportunity) Which may mean there's more merit in this idea than I initially thought. Bot will need to run a comparison of each word to the question (and accepted answer for that question) as well as the tags and calculate a percentage based on how related the twitter post is to the match. In addition to replying to users it should also post "Hot" questions regularly (bi-daily, or whatever rate makes sense) to help showcase some of our excellent community work! t_koeppen: @ubuntuexchange thanks for the tip. Gwibber is a good interim solution. WoundedLilies: @ubuntuexchange THX!! Now it works!! daw50n: @ubuntuexchange Will give a go, thanks for the tip. So of the all the tweeting and gentle pushes towards strangers it was somewhat successful test. There was increased foot traffic to the site (as gauged by my Bit.ly links) and a positive response from users being interacted with. I still very much desire the communities feedback on this, but barring any major objections I think this is a worthwhile - and potentially successable - endeavor. Your thoughts, opinions, and feedback are most welcome. I'm wary of anything that is completely automated. Suggested answers could be provided at the ready for approvers to include. A minimum reputation score could be required before a user is allowed to approve messages. I don't know enough about the StackExchange platform to know if it would be possible, but it would be awesome if something like this could sit in a box on the sidebar for users to keep an eye on. I think it would be great if the twitter account announced the user of the week or something. Not the answer you're looking for? 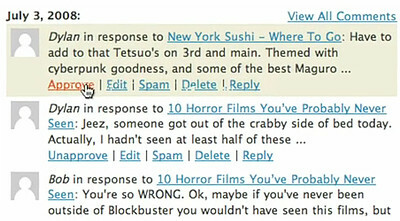 Browse other questions tagged discussion feature-request promote .